1. Terse superficial stuff about caring for them as houseplants. These usually involve a brief description of the plant, and then a colon-heavy list of care requirements, a lot of which will be phrased in such a way as to contradict themselves, or be so vague as to be useless (e.g. "Light: moderate."). 2. Pages that look like those in category #1, but which actually have not been fully filled-out, and therefore offer no information or picture and are essentially just placeholders until such time as someone manages to put something on them. 3. Lists of plants suitable for terrariums. A subset of these will be lists of plants suitable for terrariums containing reptiles, specifically, but it's pretty much the same list with or without the snakes, as far as I can tell. Assorted 6-inch pots of Peperomia caperata cvv. from work. This is kind of a depressing state of affairs, because it gives me very little to work with for this post, and a lot of what it does give me is not especially usable. So, what to do? Well, I guess we can begin with the distinction between caperata and griseoargentea (sometimes griseo-argentea). Both are smallish plants with wrinkled, heart-shaped leaves, red petioles, and tiny white flowers held on little rat-tail-like spikes. The botanical names are less help than you'd think, and could apply to at least some specimens of either species: caperata means wrinkled, referring to the leaves, and griseoargentea means gray (griseo) and silver (argent).1 The differences are more of degree than anything: caperata leaves are much more deeply grooved, while griseoargentea are mostly flat. 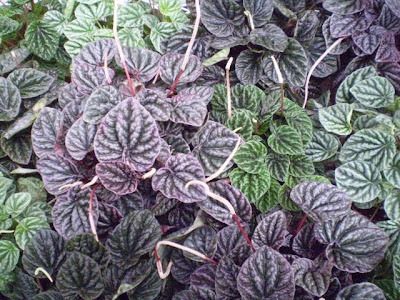 Griseoargentea is also, as best as I can determine,2 always at least partly gray, whereas caperata may be wine-red, metallic violet, dark green, white with green speckles, or gray. There are multiple cultivars of both species, though there seems to be more interest in caperata. As far as I can tell, caperata is definitely from South America and probably from Brazil in particular. There's less information out there about griseoargentea, but the genus Peperomia seems to be exclusively from South America (with a few succulent African exceptions),3 so I think it's safe to say its range is similar, if not the same. And that pretty much exhausts the amount of trivia I could find. So let's move on to the care information. One of my own plants. LIGHT: Bright indirect or filtered sun seems to be about ideal; my plants at home do well in bright artificial light. Other Peperomia spp. do this too, sometimes: I've seen it on P. argyreia, the watermelon peperomia. The root systems of Peperomia caperata and P. griseoargentea are usually not terribly deep or sturdy, so it's important not to plant them in heavy soil, make them stand in water, or overpot them.4 According to some books and websites but not others, Peperomias are often semi-epiphytes in the wild, and usually do not have much soil around their roots. It's very important to avoid very heavy, wet soils with high peat content: if that's all you're able to get, at least try to cut it with an equal volume of perlite or something. HUMIDITY: They do need more humidity than most plants. This, plus their tendency to stay fairly small for a long time, makes them particularly suitable for terrariums, hence the aforementioned third category of websites. I haven't found their humidity needs to be all that terribly extreme, though some other people have: I ran into one person saying that without the protection of a terrarium, griseoargentea in particular wouldn't "survive for more than a couple weeks." This seems exaggerated, to me, but at the same time, I have my few griseoargenteas in the mini-greenhouse, so it's not like I've put it to the test, have I? TEMPERATURE: Don't go below 60ºF/16ºC. Injury begins around 50ºF/10ºC. As best as I can tell, this is true even for very brief cold exposure. Even temperatures in the low and mid 60s (16-20ºC) can be problems, not so much because of the temperatures directly affecting the plants, but because the plant will use water more slowly, and water will evaporate more slowly from the soil, which can lead to rot unless you change your watering habits to match. GROOMING: There's really not a lot of grooming necessary. Plants that get large will eventually start to drop leaves, and dropped leaves should be picked up or picked off, but otherwise, there's nothing time-consuming involved. As plants age, they lose their attractive mounding shape and sort of halfheartedly try to crawl; these can be cut back and resprouted, restarted from leaves and cuttings, or both. 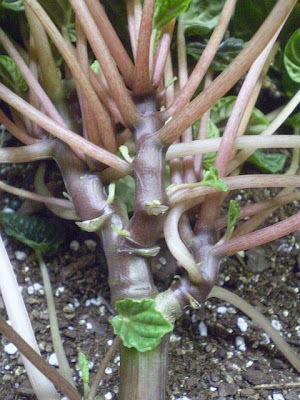 FEEDING: As best as I can tell from the growers' guide and elsewhere, Peperomias in general are not heavy feeders. However, Lynn P. Griffith Jr. is way more focused on Peperomia obtusifolia than other Peperomias, so I'm not sure about caperata specifically. If you're having trouble with small or pale new growth, I'd worry more about light level than fertilizer, but one does still need to feed periodically, just not all the time or in gigantic amounts. Super-shiny caperata from work. From a stem cutting. PESTS: They're not really known for anything in particular. Mealybugs are the most likely suspect, though Peperomias can also be attacked by scale, thrips, and various kinds of mites. 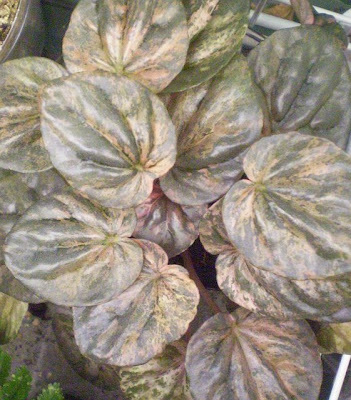 Several types of fungus and virus are known to attack Peperomias as well, though those are primarily issues only during propagation. Personally, I've only experienced fungus gnats, and then not in any huge number. The plants at work have never, to my knowledge, had any bugs whatsoever. 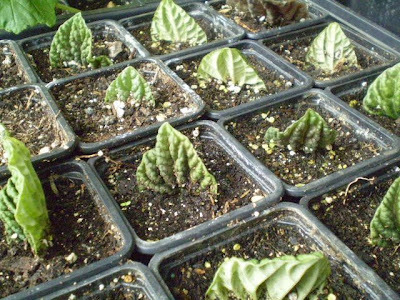 PROPAGATION: Part of the reason I like Peperomia caperata and P. griseoargentea so much is that they're very easily propagated, by several different methods. The most straightforward is by stem cuttings: these species naturally branch as they grow, and any branch can be broken off and planted. I've thus far only done this at work, but basically you take your plant, snap off branches with your hands, and stick them into regular potting soil. No rooting hormone, no fungicide, no vermiculite, just the straightforward sticking of stuff into dirt. The heat and humidity of the greenhouse environment probably helps, but this should be easy enough to do at home, too. At least four potential plants here, looks like. Maybe five. The more entertaining way to do it, though, is to use leaf cuttings. Clip a leaf off of the plant, shorten the petiole down to a couple millimeters long (about 1/8 inch), and then plant it in potting mix with the tip of the leaf pointing up and the remains of the petiole slightly below the mix. This also works with vermiculite. It takes a while (vermiculite seems to take longer than soil, which I find surprising), during which time the mix needs to be moist but not soaked. Tray of leaf cuttings in 3-inch square pots. Eventually the plant will produce new leaves from the old petiole (see earlier post), and the plants can be potted up individually when the new plant is producing decent-sized leaves. (Or you can just leave them where they were, if you started the cuttings in pots to begin with.) The original leaf will usually rot away fairly soon after the new leaves start coming, though not always. Occasionally leaves will produce more than one new plant. Overall, I have about an 85% success rate with leaf cuttings: a few will always rot immediately, but anything that doesn't rot in the first week or so will generally go on to produce a new plant. So they're fun plants to play around with. The flowers, as mentioned, are extremely tiny, are produced on white to cream-colored spikes, and appear whenever the plant feels like producing them.5 I was unable to find any information at all about seeds for these species: I assume that they must exist, because there are a few instructions around for sprouting seeds of other Peperomias, but nobody has them for sale, nobody has pictures of what they look like, and the individual flowers are so tiny to begin with that I expect you could look directly at the seeds and not see them. If they are being produced in the greenhouse, they're not especially viable: I can't say that I've ever come across a seedling on the greenhouse floor, or in a neighboring pot. Caperata has a number of cultivars, though aside from 'Emerald Ripple,' none seem to have consistent names from one grower to the next. Davesgarden.com lists 'Metallic Ripple,' which varies from red to gray, 'Schumi Red,' which is in fact actually red, and 'Red Ripple,' which looks to me more like a griseoargentea cultivar and is more of a purple and/or greenish gray. Glasshouseworks.com offers a 'Silver Ripple,' which is a fairly plain gray. At work, we have one that is a light cream color, with flecks of green throughout the leaf: in good light the petiole, and the part of the leaf surrounding the petiole, gets slightly reddish. 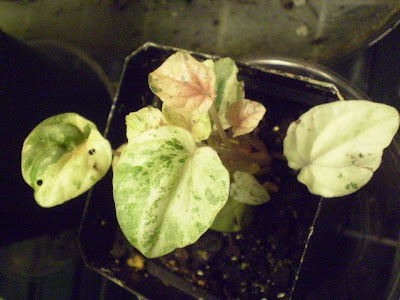 Possibly the same green-speckled white plant pictured above, just some time later. Griseoargentea has cultivars also, though aside from the gray-on-gray species, most of the other varieties I've run into have resembled the one davesgarden.com calls 'Pink Marble.' The variety we have at work has new leaves of a pink to coral color, which slowly become flecked with gray as they age, and ultimately become solid grayish green. I made a few new plants from this plant at work, and eventually bought one and brought it home, and when grown at home, the leaves come in as a mix of peach and gray, and then stay that way as they age. It might be that mine is different because it's younger, and it might be that it's different because it's in a different environment. I don't know which. Baby from a leaf cutting of the above plant, raised at home. Which is another interesting point: the same plant can look very different when grown under different conditions, which makes positive identification of a specific cultivar a little more difficult. None of the cream-colored caperatas with green flecks from work had developed the reddish spot around the petiole, to the best of my recollection, but the ones I brought home with me did. The pink-to-gray griseoargentea, for me, was more of a peach-flecked gray. New growth on 'Emerald Ripple' is frequently a dark purple-gray around the petiole, before eventually turning green. So they still have the power to surprise you once in a while. They have a lot going for them: they're interestingly textured, some of the color varieties are quite pretty, and they're non-toxic to pets and kids. 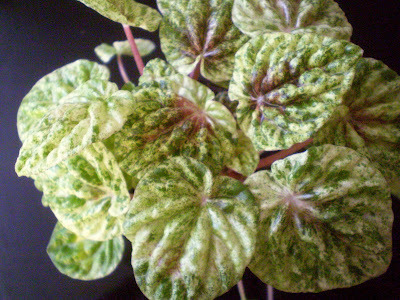 However, I wind up not recommending them to customers very often at work, because almost every customer who asks for recommendations wants the same thing: a low-maintenance, low-light, neglect-tolerant plant for a work area or living space.6 Many, many plants fit that description better than Peperomia caperata and P. griseoargentea do. (Many Peperomias also fit that description better, actually.7) We do have the occasional customer who's looking for something terrarium-friendly, and in those cases I'll take them directly to the Peperomias and not let them leave until they pick one up, but those situations are rare. I had enormous difficulty coming up with a "person" for these plants. Usually I wait to do a profile until I have a person-plant match, but in this particular case, I'd been thinking a lot about these plants already, and was optimistic about finding something interesting to say about them, so I went ahead and committed myself to doing it on the assumption that sooner or later something would occur to me. Which didn't happen. 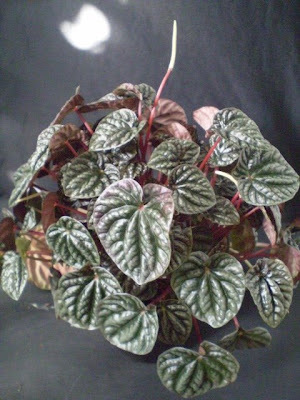 In the end, I resorted to the technique I used for Hoya carnosa and Begonia rex-cultorum, and put a few descriptive words into search engines to see if anything would come up consistently. I used a few different combinations of words like "wrinkly," "gray," "entertaining," "cute," "adorable," and so forth: mostly these yielded hits about bulldogs, ironing, and Mel Brooks,8 but there was one in there about Estelle Getty (Sophia, on "The Golden Girls"), and that fit well enough that I ran with it. In fact, in retrospect it seems kind of inevitable, no? Photo credits: all photos are my own. 1 For reasons I can't quite get my head around, caperata's generic common name is usually "radiator plant," among those reference sources that provide one, but it's more often referred to as "Emerald Ripple," which makes more sense but is still sometimes wrong: Emerald Ripple is actually a cultivar name, and only refers to the dark green variety. It's gotten generalized to the point where people sometimes talk about any caperata, regardless of color, as being an Emerald Ripple, but the other color varieties have their own names. 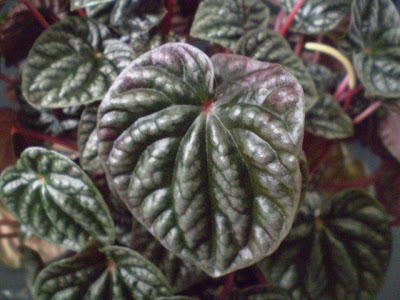 Griseoargentea is also confusing: it's usually called the "ivy-leaf" peperomia, though its leaves aren't shaped any more like English ivy (Hedera helix) than caperata's, nor does it have an ivy-like habit, or ivy-like coloring, or anything else relating in any way to ivy. The 1978 book Crockett's Indoor Garden (Crockett, James Underwood, Little, Brown and Co., Boston, MA) says that griseoargentea "looks like a small heart-leaved philodendron," a resemblance I don't see at all. Either I have badly misidentified it, in which case so have several other people, or names have been shuffled around crazily between 1978 and 2009, or James Underwood Crockett was growing something more powerful than Begonias in his greenhouse(s). 2 I'm open to being corrected, if anybody knows differently, but I'm basing the IDs here on the amount of leaf wrinkling, and by the few pictures I've seen on-line that had griseoargentea identified as such. 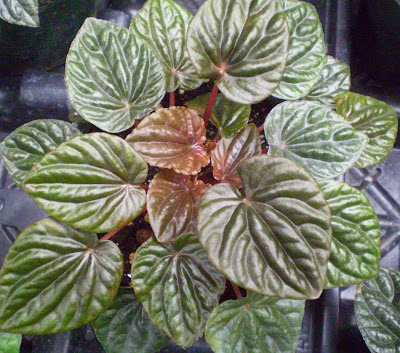 3 There are also a few claims of Peperomia species native to Hawaii. Continental drift could explain Africa, if it had to, but Hawaii doesn't really make a whole lot of sense to me. I think I believe the claim; I just don't see how the seeds would have gotten from South America to Hawaii without human intervention. 4 And by "overpot" I mean putting a plant in a pot which is much too large for it. This is a weirdly common problem, and I think it stems from the mistaken idea that giving the plant more soil is a way of being nice, that more soil means more room to grow or something. 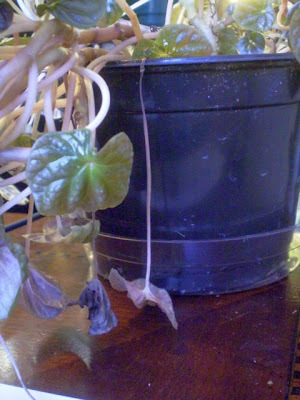 In actuality, overpotting either prevents air from reaching the roots, suffocating them, or it holds water at the roots so long that they rot. The parenting equivalent of overpotting would be buying your five-year-old son men's XXL shirts, men's size 11 shoes, and jeans with 40-inch waists: it's only good for the child to the extent that it's a step up from having no clothing at all. 5 Actually, I ran into one bit of text somewhere that said that flowering is partly temperature-dependent: Peperomias are short-day plants when temperatures are warm, and indifferent to day length when temperatures are cool. I was unable to verify this, and I don't remember where I saw it in the first place. Make your own observations. 6 And in fact they also often ask for something that flowers, as well, which if they find Spathiphyllums acceptable means that the conversation pretty much ends there, and if they don't like Spathiphyllums -- which many people don't -- then we have a talk about reasonable expectations for low light. 7 Thinking mostly of P. obtusifolia, which I had some issues with back in college, but which has behaved itself just fine for me since I got my current specimen nine months ago. These are some of my favorite plants. I love the texture of the leaves, I love the colors, I love the growth habit. Even so, I don't own one now, and they are on my personal "never again" list. I've never been able to keep one alive and looking nice for more than a few months, a year maybe at the outside. I suspect it is a watering problem; I've never been able to get it right. In fact, I suspect that not many people can get the cultural requirements right, which could explain the lack of information available. Such a lack is unusual for species that have been grown as houseplants for decades, are readily available commercially, and come in enough varieties to appeal to collectors. Someone told me that the plant No.3 looks like a Peperomia sp. I found your topic here and it looks quite similar. Could you suggest which species is it? Well, there's a chance, though it's too cold to even think about before April, and work gets crazy from about March to June, so it could be a while. Ask me again in April, or try Glasshouse Works or somebody like that. Having seen the pericallis jester bi-color, when they set seeds, could you send me some? The Pericallis in question are long gone, and wouldn't necessarily have set seeds anyway. 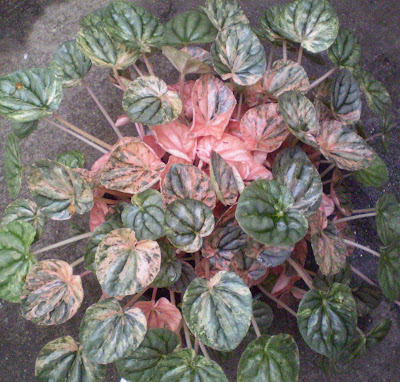 i have just learned that my beloved plant whose identity was hitherto a mystery to me is peperomia griseoargentea. the thing that really captivated me about this plant was the sweet fragrance of the long spike blooms, which happened fairly recently after i had had the plant for a couple years. i'm glad to have found your post, i am excited to try growing from leaf cuttings! Hi. I love your blogs!! Just wondering if you've ever sold plants on eBay? Or if you might consider it? Since reading your blog about peperomias I've been trying to find some with no luck. I just purchased one today. Very durable leaves.... The color is so deep green. The leaves are super crisp. I just found your blog today, through a 2008 entry on Tradescantia. I was so glad to find you're still writing. I'm working with Peperomia caperata as a memorial to my mother, who has Alzheimer's. But when she was young she made wine bottle terraria with a single plant, positioned with a skewer. They went everywhere as gifts, especially during the Almaden years. I sell them as low light, no maintenance, forever plants. I found a bottle behind a sofa at camp, no doubt secreted by the grandchild who knocked it over. It might have been there for years. I greened it up, and someone bought it for the story! (Not trying to sell anything-can't be shipped planted) Of course they'd like more light, but then the'd try to grow too much. I barely water them at planting, and then never again. I think they produce enough vapor on their own. For years I couldn't find the plant. When I locate one, I propagate like crazy! I took a video a few years ago of my mother planting a bottle. She couldn't remember, but her hands did. Thank you for such a thoughtful, well-researched blog. Especially the subjunctive part. I have one of these I picked up because I've had great luck with my astrid peperomia (I had to go find photos of how big they could get because I was shocked at how quickly it doubled in size - and then doubled again) and it has been such a moody and mopey little thing. Still alive, but looks very ragged and pathetic. Now I'm pretty certain that it got a nasty chill sitting on too cold a part of my windowsill! It's good to hear they're pretty keen to sprout from leaf cuttings. I have a few containers kicking around that would make a decent terrarium, so I might start over and see if a crop of new baby caperatas do a little better with some shelter.